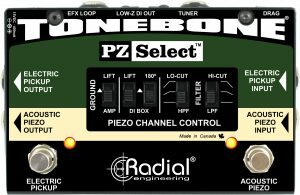 The Radial PZ-Select is a feature-packed signal switcher designed to work with today’s new breed of hybrid electric guitars and basses that employ both magnetic and piezo pickups. 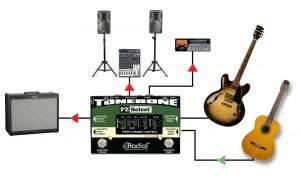 It is also perfectly suited for players that need to switch between electric and acoustic instruments and send separate signals to the on-stage amps and PA system. The design begins with two separate channels: The first is dedicated for electric guitar – the second is optimized for acoustic. Two easy access footswitches allow the artist to effortlessly select between pickups for a seamless performance on stage. The magnetic-electric pickup channel features Radial’s award winning class-A buffer for absolute signal integrity. This is augmented with Drag Control (TM) load correction to counter the effect of the buffer for a more natural tone. The piezo-acoustic channel features an ultra-high 10meg-Ohm impedance that at once broadens the frequency response while smoothing out the peaks and edginess that often plagues these transducers. A built-in 3-position high-pass (low cut) filter helps eliminate excessive bottom end which could cause the sound to be muddy and indistinct. When used with an acoustic instrument, the filter works with the 180 deg polarity reverse to help eliminate resonant feedback. A low-pass (high-cut) filter has been included to help warm the sound of active piezo systems that can often sound harsh. 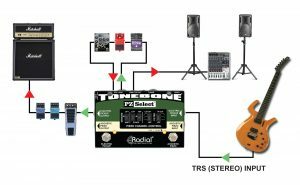 There are two outputs to choose from: A standard ¼” output to feed a stage amp and a built-in Radial DI box to deliver the piezo-acoustic tone direct to the PA system via a low-Z balanced XLR out. 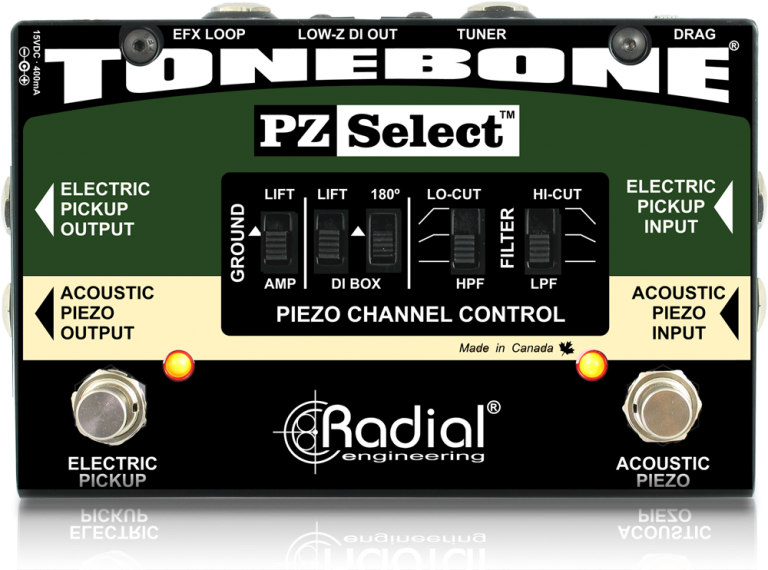 A dedicated effects loop on the piezo channel lets you connect a series of pedals to feed both outputs. Selecting channels is simply a matter of depressing the associated footswitch. Bright full-sized LEDs provide visual clarity under stage lights to show the selected channel. 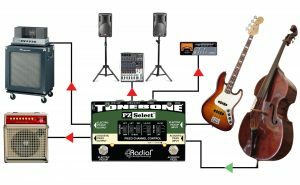 Even when off, the signal from both pickups are combined and sent to the dedicated tuner out for quiet on stage adjustments. The PZ-Select… a powerful switcher that lets you seamlessly select pickups and instruments using the power of your feet! 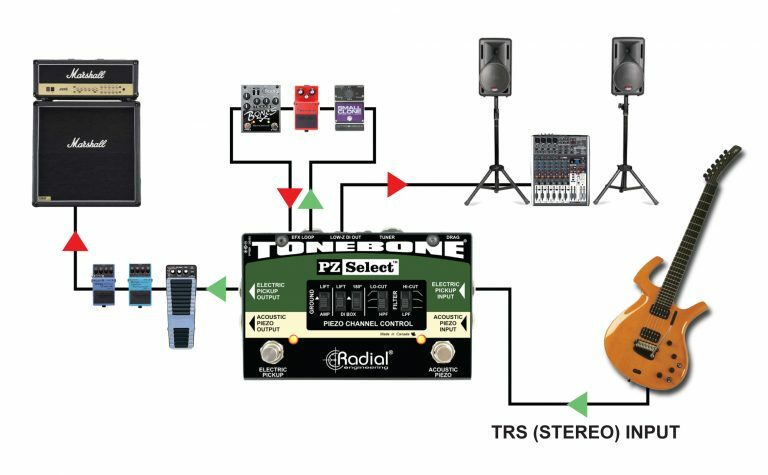 Connect your guitar using a ¼" TRS stereo cable and use the PZ-Select to switch between electric and acoustic. Add separate effects for each signal path and send the signals to separate amps or the PA for optimum tone. Seamlessly switch from your electric bass to your upright with dedicated channels for each and send the signals to your two amps, PA and tuner! The ultra high-Z impedance on the piezo input will maximise your tone for the upright. 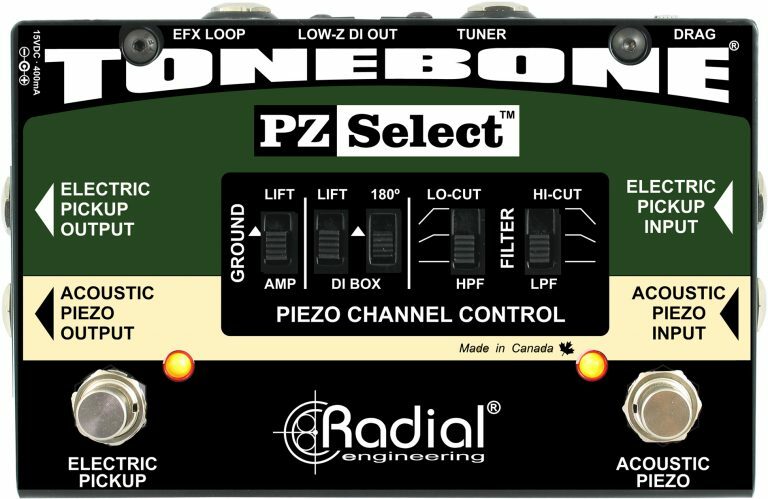 The PZ-Select lets you switch between two completely different guitars and manage the signal for best sound! 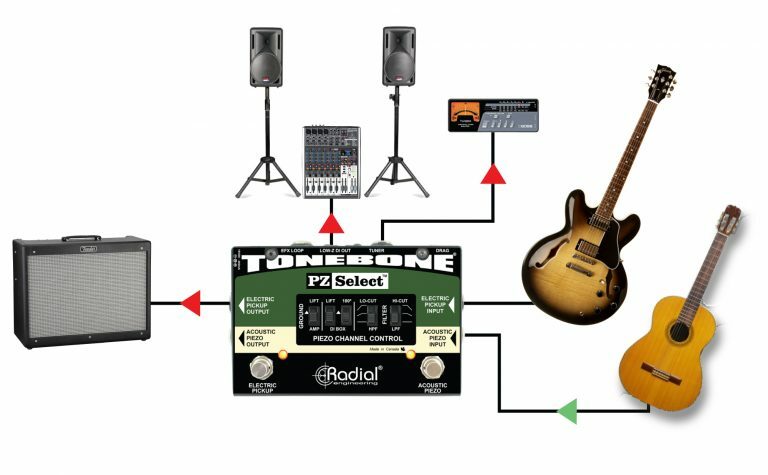 Send your electric to your stage amp and your acoustic directly to the PA. Add a tuner to keep everything in check!